One pot of stevia that survived the winter inside is obviously hurting for more sun. The long spindly stems look more like vines now. Currently ouside in the rain, I will probably cut it back and let it regrow. 2 smaller stevias in a small pot are doing well on a west facing window, they get a lot more sun than the larger pot. Has anyone tried starting seeds yet? Other than planting a bulb which was already starting to grow I haven’t. The bulb seems to be doing well in a pot so far, and if I can drill a hole in the botton of the pot for drainage I’ll try putting it outside. Today I put my seed started over wintered inside scallions into a new pot outside. They replaced the previous ones which were a few years old. They should have no problems in the cooler nights. More bulbs went into another pot, and I am going to try some harvested stevia seeds in an indoor window sill pot. I think I’ll try to find a good garden journal app- I’ll post the name if I find one. Check out ‘moment diary’ in the Google playstore. I didn’t have much luck finding a garden journal, but this diary app should work. It time/ date stamps your entries and you can embed pictures too. I started using it with today’s garden activities. You can password protect it if you actually use it as a personal diary, you can back it up and export your data. I should probaby read the instructions, but it only took a few minutes to figure most of it out. Plastic or ceramic containers? I’ve used both, each has their advantages. Plastic is good for a couple seasons unless they get blown and fall to their end. Ceramic is heavier and more forgiving of unexpected winds. Winter is almost sure death to ceramics, one or two freezes and their cracked. Plastic is cheap, ceramic expensive by comparisons. Which do you use, any preferences? I filled my first new plastic box with soil today. It’s replacing some old ones that are aged and cracking. Green/ string beans, Oregano, and Rosemary in that one- all seeds. Excluding some bulbs from last year, those and a test of my harvested stevia seeds are my first plants of the season. I updated my diary app turned garden journal. Has anyone started planting yet? 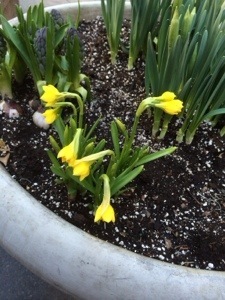 Looks like your garden is happy with the coming of spring! Just a little more time, I’m sure and it’s gonna blossom fully. Enjoy this lovely gardening season!